There’s a small possibility that the first album I bought was by Rod Stewart, because I was a big fan when I was in the single digits. My mom once dedicated an entire day to calling in to a radio contest to win us tickets to a concert. I wore an awesome puff-painted sweatshirt and Rod did some crazy split-kicks. The album that really counts, though, was August and Everything After by Counting Crows. I was 14 and it was summer and my first boyfriend, a 15 year old Shakespearean actor (by which I mean I saw him fake sword fight in Something’s Rotten in the State of Denmark on the middle school stage and immediately fell in love) was away at his family’s camp and since this was pre-internet, we sent postcards back and forth. 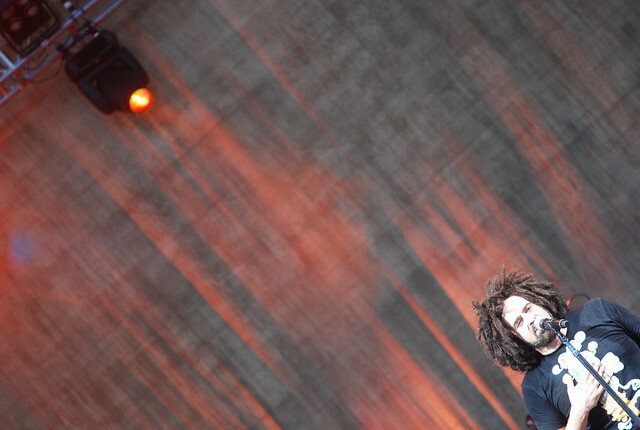 The summer was hot and slow as I waited for the mail and laid around on the itchy carpet of my bedroom and listened to Adam Duritz sing about Omaha and the weather in Baltimore and I felt like a musical intellectual for recognizing the ‘sha la la’s in “Mr. Jones” were a reference to Van Morrison’s “Brown Eyed Girl” (a song, no small coincidence, that lovely boy said reminded him of me, since I did – and do – have brown eyes. Oh, the imagery.) I knew all the words and all the jangling guitar parts, and the longing of that album became a soundtrack to my summer. I can put on “Rain King” even now and feel the transcendent joy of understanding what the guy on the other side of the song was feeling, thinking of heaven and the burning heart of god and black winged birds. I counted crows in the neighbor’s yard all that summer. I still do it, sometimes, on the highway. One for sorrow, two for joy – the rhyme is right there, potent with mysteries I had yet to understand and feelings I knew all too well. Summer stretches between the end of school and the beginning again, when school is your life and your structure and your boyfriend is also in the marching band in between his A-list acting gigs in the drama club. Fall brings frost and you’ll refuse to wear your coat even though you’re shivering and still all of your friends will sing along when “Round Here” comes on the radio and you’ll rub your shirt sleeve on the steamed up windows of the car, because you all know the words, because music is infinite when it’s shared and you all experienced that longing and that separation from your love. You memorized songs telling you how you don’t have to waste your life now, darling, as though you knew what wasting your life was even about at 14, but you knew about secrets never to be told, code words in the shaky left-handed script of a perfect boy because can you really say ‘love’ out loud in black ink like that on a post card where anyone can see? He’s married now. I’ve seen the pictures on Facebook. I secretly hope he still sword fights and tastes like Altoids. And maybe ‘sha la la’s will always make him think of me, and of that yellow album cover and August, when we waited and waited and sang. Andrea LeClair writes stories, chases chickens, and searches for master narratives in the library while also teaching patrons about e-books. I wrote a guest post for my friend and excellent photographer Aggie’s cool series.